We have fallen into a daily routine, finally, for the summer. I get up first, walk and feed the dogs, feed the indoor and outdoor cats, and then finally get to make coffee. I use old-fashioned cone-shaped melittas and filters because I think it tastes better and there is less machinery on my limited counter space. My cup: Tasmanian devil drinking coffee, or Maleficent (evil witch from Sleeping Beauty), or the snowflake cup. My daughter’s cup: a wolf howling at the moon, or the one with pink and purple hearts all over it, or the smiling kitty cat. My husband’s: The NASA cup, or the one with equations all over it relating to rocketry, or the JFK library one. During my first cup of coffee, the house is quiet and serene. The dogs sigh on their respective chair and couch, already back to sleep. Maybe there is the hum of the dishwasher doing the dishes from last night, or the chug of the clothes dryer, but otherwise the house is silent. I get to sit, read my email, make my list of things to do that day (the sub-list, drawn from the 3 page master list, that includes only the absolute essentials) and contemplate the morning a bit, basking in the quiet and peace. Then, abruptly, all hell breaks loose. My daughter never seems to come awake slowly. Her bedroom door opens with a bang. She stomps down the steps, clanks 4 to 5 cups and bowls from her room onto the clean counter, and sleepily demands, ”Did you make me coffee?” before banging open the refrigerator door and getting milk. My husband quickly follows, although a little more quietly, and everyone fights for counter space to pour cereal, make toast, pour milk into coffee, and whine about who ate up all the blueberries or raspberries or whatever. My son tries to avoid mornings … but his work schedule sometimes demands an early start, and he does his best to inflict his misery on everyone around him when this happens. I wish I could stretch out that lovely quiet that exists for about 10 minutes every morning before everyone else is awake. This morning, there was a gentle rain that I could hear through the open window in the kitchen. An occasional excited dog bark sounded from the twenty or so dogs that get walked every morning in my neighborhood. The oppressive heat and humidity of midday hadn’t yet descended. It was a happy time. Why would you want to make a rug out of smaller units that are laced together? For one thing, it’s a lot easier to travel with smaller units. We’re headed up to “the camp” that my husband owns up on the St. Lawrence River this Friday, so I have to think ahead as to what I can reasonably pack. The problem with assembling a rug of smaller units is that you have to make sure that your fabrics for each unit are EXACTLY the same size/weight when braided up. If you try to fit in a unit that’s too big, or too small, it just won’t work. So identical weight fabrics are key. 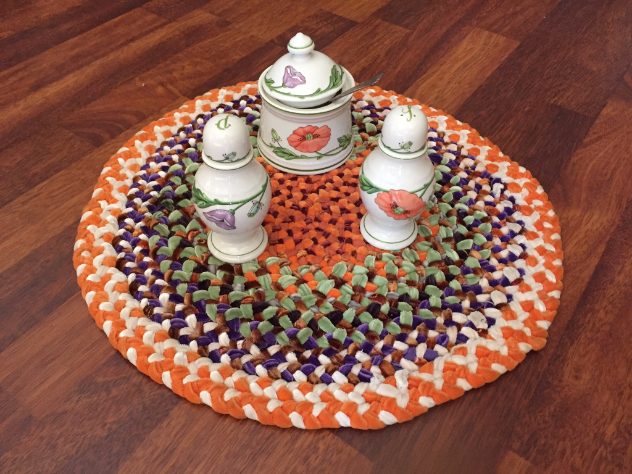 Many people have made granny square rugs, which are assembled square units. This sort of rug is also possible with hexagons. I tried to figure out a rug of puzzle-shaped pieces, but I never managed to get the corners to fit together neatly. Usually units such as this are e-laced or shoe-laced together. Sometimes you can figure out a way to avoid this – if you make a unit “backward” – with the folds to the outside, and corners turning in the opposite direction. If you look carefully at the above diagram, you’ll see that this is the way I plan to make the 2 pink and 1 center black units: the Start and Finish are on opposite sides compared to the other units. This way, I can lace regularly between units. So, this is a good challenge for me to try to figure out while I’m up at the camp: what lengths between quadruple corners will look good, how to adjust for the sides, how to flip directions and still keep everything fitting together… looking forward to it! This 21′ diameter beautiful — but very worn — 4-strand braided rug from 1943 is found at the Lincoln Boyhood National Memorial. It is in the hall honoring his mother, Nancy Hanks Lincoln. I have a big article in the newsletter about its history, and Country Braid House is making a new one for this site. Christine here. The summer is always one of my most difficult times. The kids are home and need chauffeuring around Pittsburgh to things where there is no parking; my husband doesn’t teach during the summer and inconveniently invites family and friends to come stay for awhile; and, in the division of marital labor, the mowing has fallen to my husband but the trimming, weeding, and planting have fallen to me. And we have a big yard (for a city, anyway). This is an especially busy summer due to a bunch of other details – a car broke down and stranded me in Harrisburg for a week, then we had to shop for a new car. My husband had to consider every possible car option… before we went out and bought the exact same model we got 14 years ago. The one good thing is that the new vehicle has individualized temperature controls for the front passengers. At this time of life, I am only comfortable with the air conditioning set on Arctic Blast, and my husband takes issue with having to wear a winter coat in the summer just to ride in the car with me. Large Braided Star pattern is found in the current newsletter issue. Some other Difficult Summer details: we are getting some carpentry work done on our exterior cedar shakes and a couple moldings, and we have taken to calling our carpenter “Annoying Man” because he either calls us 5 times a day with questions, comments, or excuses, or doesn’t show up at all. This is in preparation for exterior painting. The garage needs to be replaced, which will also be a lot of money. And, my Dad is sick with some unknown problem that has made him lose 20 lbs. in the past month. That worry underpins all my thoughts. But, as John Lennon sang, Life is what happens to use when we’re busy making other plans. It’s been making me think a lot lately about how we choose to spend our time. We all have a certain allotment of time in a day that is our own, and how we choose to occupy it is a big indication of our personality and our goals. There are truly situations in which we simply “don’t have time” at all – raising small children comes to mind, or caring for someone who is sick, or having an insane job. Then, our time is not our own to choose what we will do and what we won’t – you simply move from one task to the next, marching forward, handling the next situation as it comes. Many of us are beyond those demanding situations, and we have reached a point in our lives where we can have more freedom to choose how we spend our time. And yet, day to day, doesn’t it still feel that we’re rushing to get this or that or the other thing done? I have a “TO DO” list that I cross off every day, and it has grown to two tight pages. Sometimes my husband “helpfully” adds items to my list. More tick-off squares get added every day. How is this possible? A pattern for this small star ornament is also found in the current issue of the newsletter. I’m reminded of that wonderful piece of satire written by Judy Brady back in 1972: “Why I Want a Wife.” She listed off all of the things that wives do, and said she wanted one for herself (Ms. Magazine, premiere issue, 1972). Think of how much more time we’d have if meals were never our responsibility, dishes washed themselves, and someone else figured out the mysteries of food shopping. Since my husband has shown no inclination toward changing his gender, I guess I’m stuck with my situation as it is. I remember when I was a kid that there was this idea of “leisure time.” That one day, in the future, we would all have jobs that only required about 25-30 hours a week, but we all would have enough money despite that, and leisure time. The image was of smiling families out together driving their big American cars toward some sunny golf course, or beach, or other vacation spot… all tanned, rested, and ready. In the summers, I don’t have leisure. It’s supposed to be a more relaxed time of the year, but I feel as if I’m scrambling to keep up. There just doesn’t seem to be any time left at all for sitting, relaxing, and braiding. And, do you know how long it’s been since I just sat and braided a rug???? No wonder I’m going crazy. It has been awhile since I have blogged. 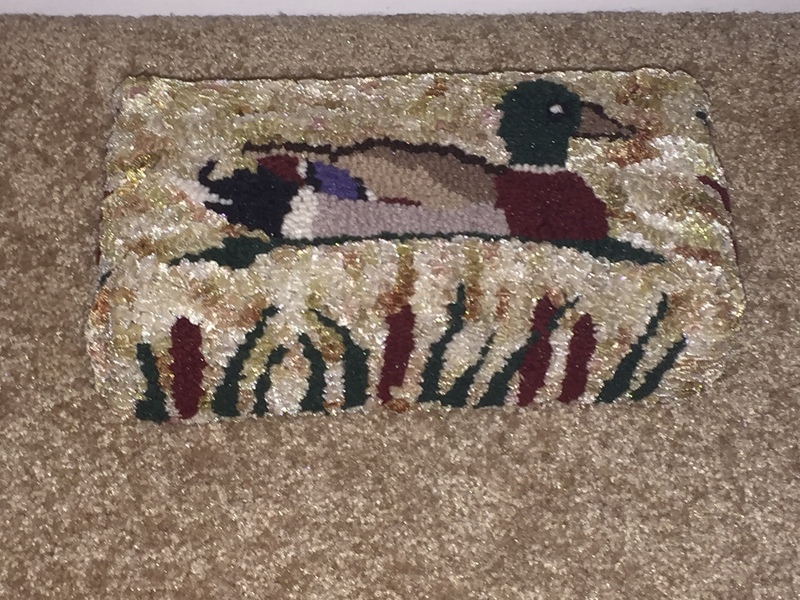 To be truthful, I have been writing and responding more to the Rug Braiding Group on Facebook than blogging here. We are up to more than 470 members and the discussions can be lively with admiration for posted ‘rugs’ and advice and answers for questions by members. 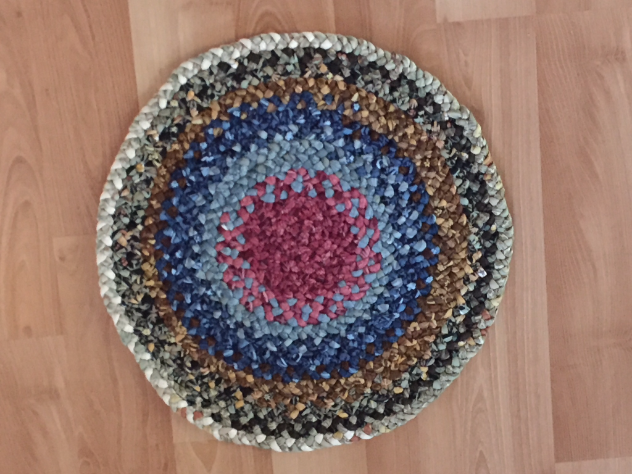 If you haven’t joined, suggest you give it a try: just search groups for Rug Braiding. FB will ask me to approve you and away you go. For those of you who do not want to get involved with FB, this is a pretty narrow way to do it. My understanding is that the group postings including yours only stay in the group and are not shared with your ‘regular’ FB friends unless you share. Another reason I check FB frequently is that my youngest daughter is traveling in South America while on a leave of absence from her techy job. She is as unplanned as I am planned and so it is so nice to be able to talk and text through FB Messenger and (don’t tell her) I can tell when she was on last, so if less than 24 hours, I don’t worry as much! Anyway, I was asked recently to write an article for my ATHA Hooking Guild on Hooking with Other Fibers. I pulled up a bunch of pictures and realized that I have experimented with quite a few other fabrics for both braiding and hooking. The article and pix for them will include a number of braided items and this post for you will include a few hooked items….so Kris McDermet can be extra proud that I am a combo….and just ask me sometime how difficult I was when Kris, an ultimate in rug hooking, offered to teach me and lead me along…..we often laugh about it now. My first braiding with velvet was a tiny braid mat. I found a velvet remnant that perfectly matched the wool combination I was using. I remember telling Christine what I was doing and she said “Oh velvet, that sounds great but isn’t velvet kind of fussy?” I have often laughed at the truth of her words, but I’ve grown to appreciate it anyway! I probably gave away that mat but enjoyed the texture contrast. So I began to buy velvet remnants for possible non-rug braiding projects, first incorporating the velvet with wool and then using all velvet. 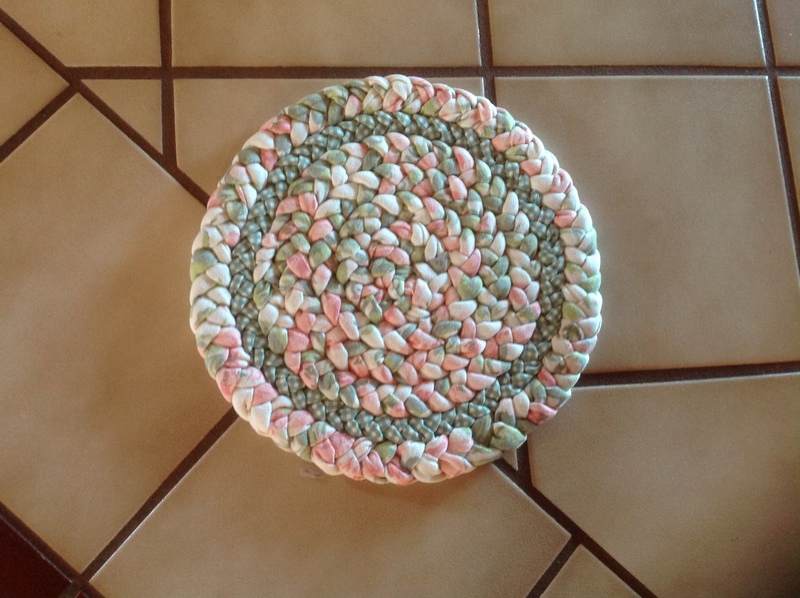 I tried to use all the colors in my everyday dishes for this table mat. You can see my stash of bought velvet was growing! I was a little bored hooking the dark charcoal wool, so I tried some random black velvet on impulse; I liked the look and added maroon velvet as stems and in the braid. 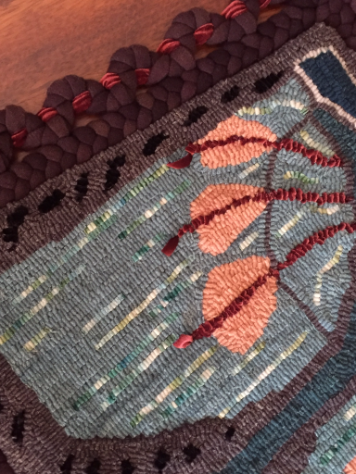 I wrote an article for Rug Hooking Magazine about incorporating velvet into hooking and got some good feedback, so kept going! My friend Kris McDermet and I began to make ‘braid bowls’ with hooked bottoms and braided sides. 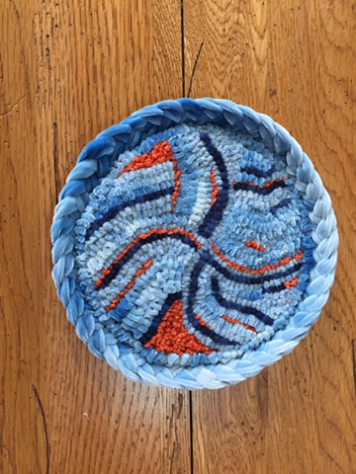 This velvet bowl is hooked with hand dyed velvet, wool and chenille and the braid is more of the velvet. By now I was dyeing the stretch velvet and trying to use it up so I could dye more. background which made it go so much faster. The duck was another UFO. I had hooked the duck with the kit wool but left the background unfinished and when I saw it recently I didn’t like the yellow background wool so used some velvet. 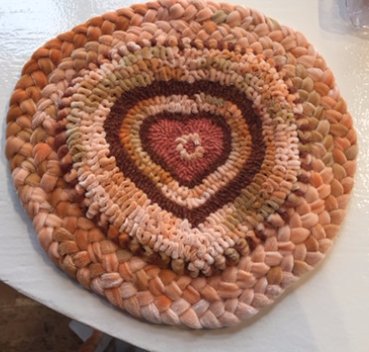 This heart was hooked with hand dyed velvet, unspun wool and ‘as is’ wool and braided with velvet. I have braided with denim and am making a third jean rug for my blue bathroom. I think I have shared the second one in previous posts. The variety of blues in jeans is amazing and the rugs will be washable. 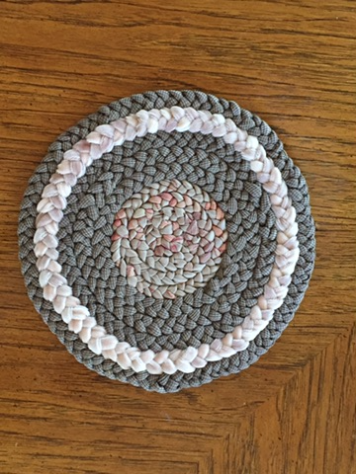 As mentioned in my last post, I have recently experimented with braiding cotton for table mats. Here is the finished William Morris quilting jelly roll, a cotton and velvet mat made from scrap sheeting and an all cotton mat from retro cotton fabric and gingham. So what’s your experience braiding (and hooking) with other fibers?